There has been much in the press this month about Blood Swept Lands and Seas of Red, the impressive art installation of 888,246 ceramic poppies, each representing one British military casualty during the First world War, that flooded the Tower of London moat earlier this month. For many this was a beautiful and powerful statement of the size of Britain's sacrifice, for others, a mawkish display of nationalism. The wonderful Ring of Remembrance Notre Dame de Lorette, an elliptical structure engraved with the names of the dead of all nationalities in northern France, is another powerful but controversial war memorial. The who, what, how and why may be contentious, but what is generally agreed upon is the importance of remembering. A while ago I was due to give a talk on the female special agents of the Second World War at Maddingley Hall, near Cambridge. En route I stopped to admire the beautiful stonework outside and bumped into a man doing the same thing. 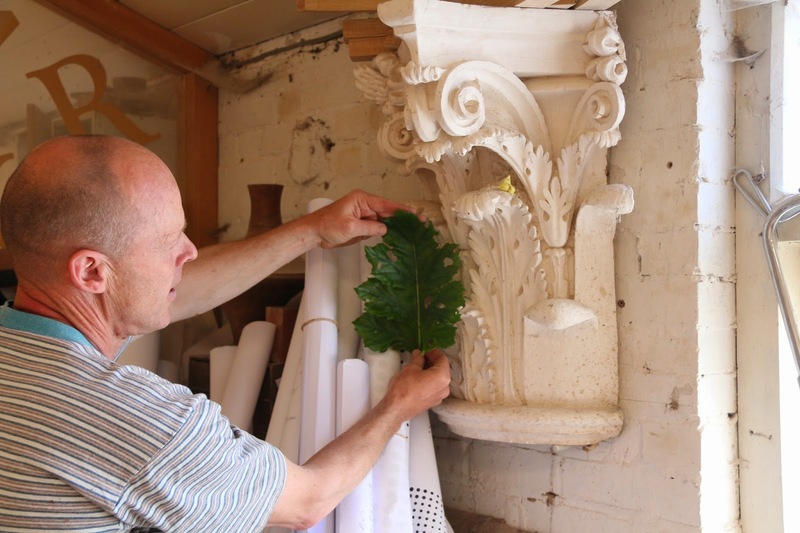 It transpired that he was Harry Gray, the stonemason, now artist, who had carved some of the pieces during restoration works several years ago. We soon discovered a shared interest in the two world wars, and fascination with the very different ways that the dead are remembered and, on occasion, honoured. A few weeks later Harry invited me, and my husband Ian, who is a sculptor, over to his studio for lunch. are acanthus leaves, with leaf from his garden. It turned out that Harry has worked on a number of war monuments and memorials, among other public art commissions. His first was the much admired frieze for the Animals at War memorial in Park Lane, but my favourite is the stunning Battle of Britain monument at the White Cliffs of Dover. 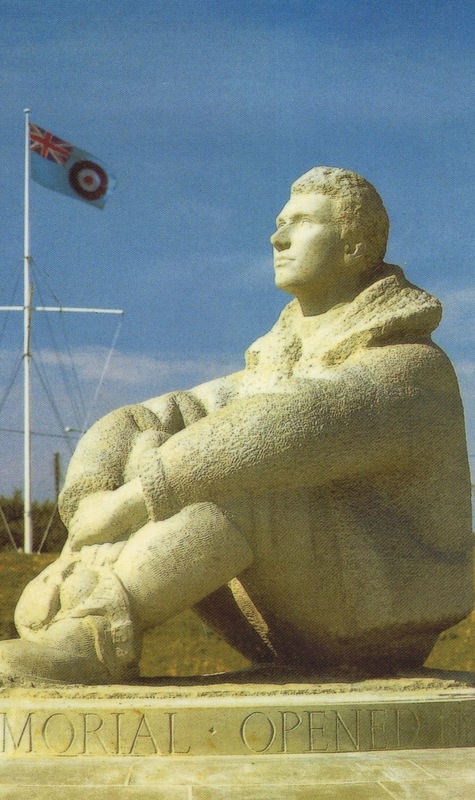 Approached from the ground, the Battle of Britain monument shows a young pilot, sitting, looking to the skies, calmly waiting for his call to action. Seen from above, however, from a pilot’s perspective, the figure is sitting at the centre of a propeller hewn from the white chalk of the ground. It is a beautiful and thought-provoking design that literally works on several levels, calling into question not just who these men were and what they were fighting for, but how their courage, skill and sacrifice has left a permanent mark on our country. 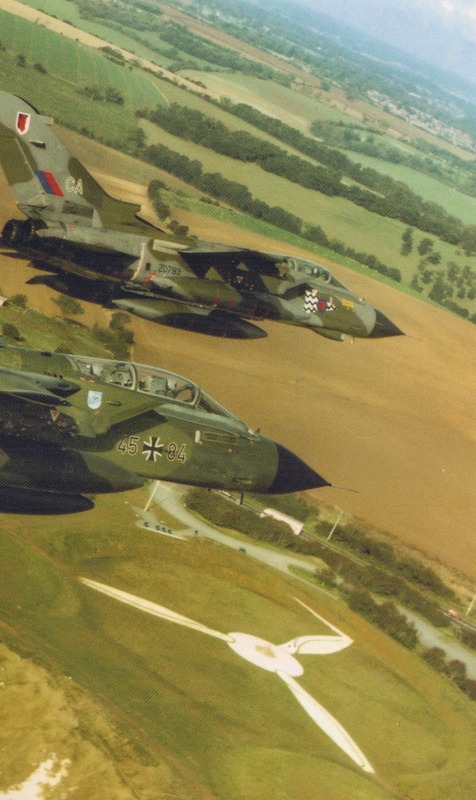 Harry had only heard about the proposal for a Battle of Britain monument when he was commissioned to produce the stone base for the winning piece. Having rather cheekily asked if he could submit his own design, he was delighted to get through to the short list. Lord Tebbit, himself a former RAF pilot, was on the judging panel, and when he saw that Harry’s pilot figure was to be hewn from Forest of Dean sandstone his only comment was that it would weather badly. Harry protested that London pavements are made from sandstone, and ultimately it was Tebbit who backed his design. The Queen Mother unveiled the monument in July 1993. Earlier that day Harry had been checking everything was as it should be when he was surprised to see a woman let through the security cordons to join him at the monument statue. “At last,” she told him, “You’ve made my brother’s grave”. Her brother had fought in one of the Polish squadrons in the Battle of Britain, and had been lost over the channel. Harry has since won many public commissions, and you can visit his website here. 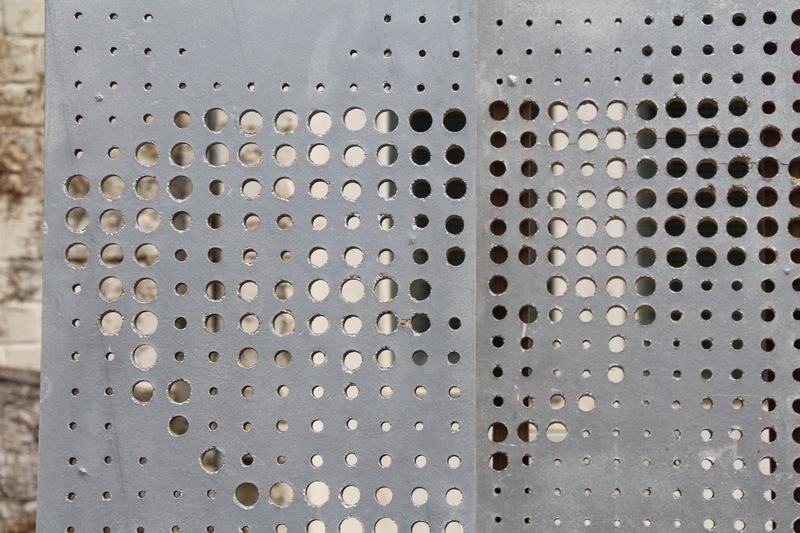 The current piece that speaks most loudly to me is his project for a public artwork to celebrate William ‘Bill’ Tutte’s code-breaking work at Bletchley Park during the Second World War. Coded signals intercepted by Bletchey Park were printed as perforated tape, or ‘Baudot’ code. 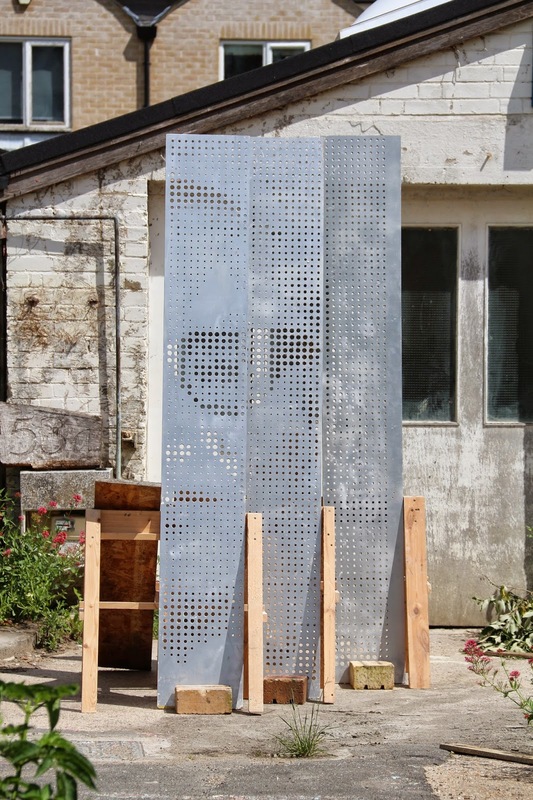 Reflecting this, Harry is producing a sculpture comprising of five steel sheets each of which are perforated like Baudot code. 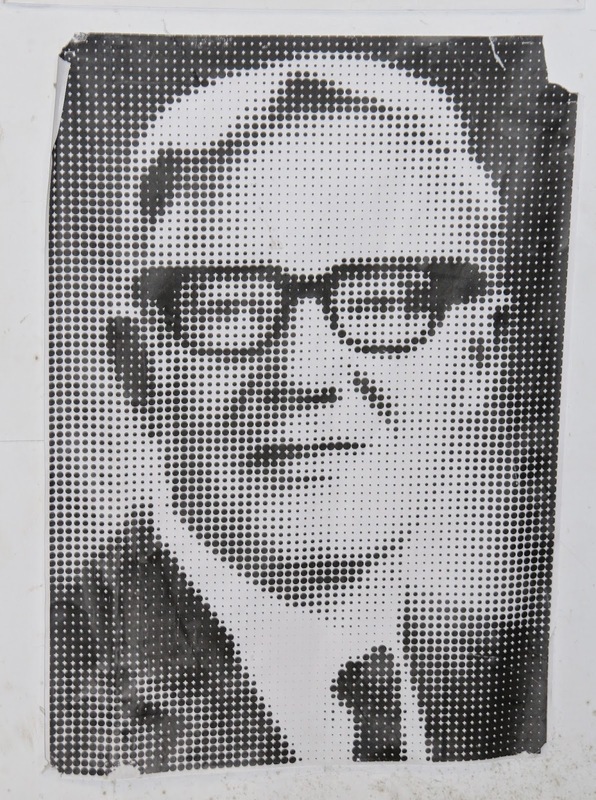 When seen from a key viewpoint marked in the paving, the perforations reveal an image of Bill Tutte through the metal sheets. In this way the portrait image itself is encoded, with Baudot in place of DNA, showing people the essence of the man in face and form. I live in Saffron Walden, within walking distance of beautiful Audley End House which was used during the Second World War as a training base by the Cichociemni, the ‘Silent and Unseen’ Polish special forces. It has always amused me that my last biography was of one of the very few Polish-born special agents, Krystyna Skarbek, aka Christine Granville, who never set foot in Audley End because she was trained and employed directly by the British. Nevertheless I am honoured that over the last few years I have been invited to lay a wreath for both Krystyna and the Cichociemni at our local war memorial on Remembrance Sunday. The Cichociemni are commemorated with a stone urn in the grounds of Audley End house, but I have often thought that it would be wonderful to have a more permanent memorial to Krystyna somewhere in Britain. I wonder now if it should be made from Polish soil, or how else to best capture the spirit of this passionate patriot and fighter for freedom. But then, perhaps writing biographies has its similarities with Harry's kind of art, in seeking to capture and present a picture of their subject that is more than skin deep? I was appalled to hear this month that cuts to the Imperial War Museum budget mean that access to the library and archives, which were hugely important during my research for Krystyna's biography, is now going to be severely restricted if not closed, and the school education packages may be stopped. I find it incredible that, at this time of remembrance in particular, we can even consider risking losing one of the most important repositories of these stories. If you feel the same, please take a moment to sign the petition against these cuts, so that we can continue to remember, honour and consider, in an informed way. I will sign the petition, Clare. I love those coded metal sheets! Thanks Carol, I love those sheet too. I just cannot understand how we can mark the 100th anniversary with any integrity while behind the scenes cutting access to these very stories. What brilliant and original memorials! I love the one of the pilot especially.